"The name ~Tumut~ is derived from an Aboriginal word meaning 'quiet resting place by the river' and that over the years this evolved from 'toomut', to 'tumat' and eventually TUMUT ". - (Ref-http://www.australiaforeveryone.com.au/nsw_names9.htm). Estimated area, six hundred acres. (600 acres). Estimated grazing capabilities, seventy cattle, three hundred sheep. Adelong , Ardrossan, Argalong, Adjunbilly, Back Station Creek , Bago , Bangadang, Batlow , Billabong, Billapalap , Bimberi, Black Creek, Blowering, Bongongo , Bombowlee , Bondo, Bogong Peaks Wilderness, , Brindabella, , Brungle, , Brungle Creek, , Buddong, Cabramurra, Califat, Coolac, , Cooleman Run, Cooleys Creek, Cornishtown , Courajago, Darbarlara , Darlow, Ellersile , Franklin, Gadara, Gilmore , Gilmore Upper, Gocup , Goobraganda , Grahamstown, , Green Hills , Gunning , Gundagai , Humula , Hotels , Hillas Creek, , Jones's Bridge, Hospitals , Kiandra, Killimicat Kunama, Lacmalac Index, Little River, Long Plain , Lower Bago, Midway, Minijary, , Mount Adra , Mount Horeb , Muttama , Nangus , Oberne , Peels Creek, Pinbeyan, Ravine (Lobb's Hole), , Red Hill, , Rosemount, Rules Point , Sandy Gully, SHOCKAROO Sharpes Creek, , Shepardstown, Spring Creek, Springfield , Talbingo, Tanyard Creek, Tarrabandra , Tarcutta , Ten Mile Creek , The grove, Tumblong , Tumbarumba , Tomorrama , Tumut, Tumut Plains , Wagga Wagga , Wee Jasper , Wereboldera, Wermatong , Westwood, Windowie , Wondalga , Wyangle , Wagragobilly , Yarrangobilly , Yaven Creek, Yass, Yellowin. Timber & Forest Industres . .. 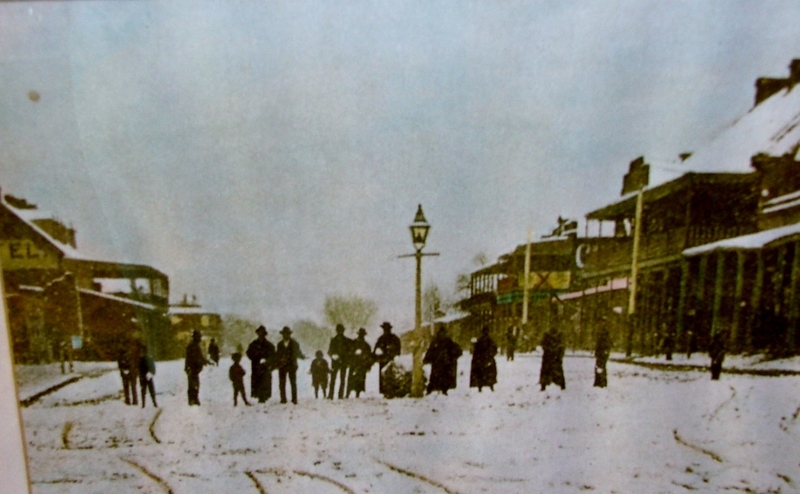 Portion of Tumut Town Map and an early snow photo. When? 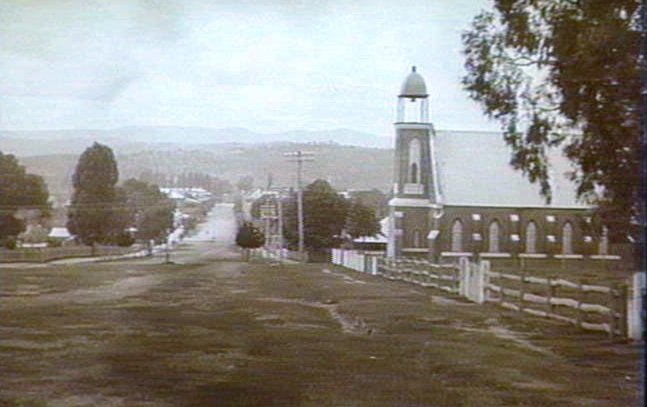 A couple of views of early Wynyard Street, Tumut. 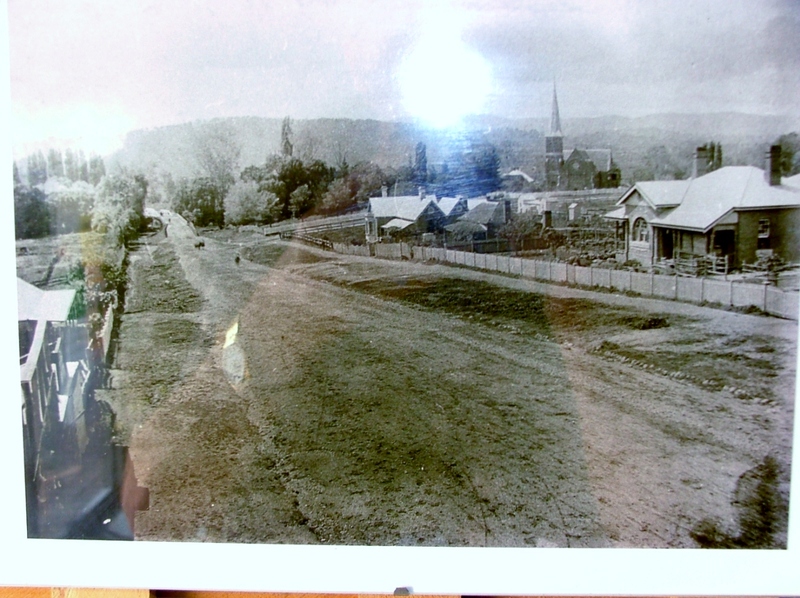 Notice double story house just off centre before the Tumut River in photo One - it was build by Mr & Mrs Kindred. Middle photo to the Caravan Park. 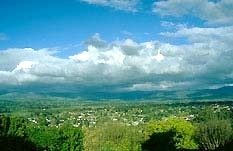 Then a view of a portion of Tumut towards Bombowlee and further. 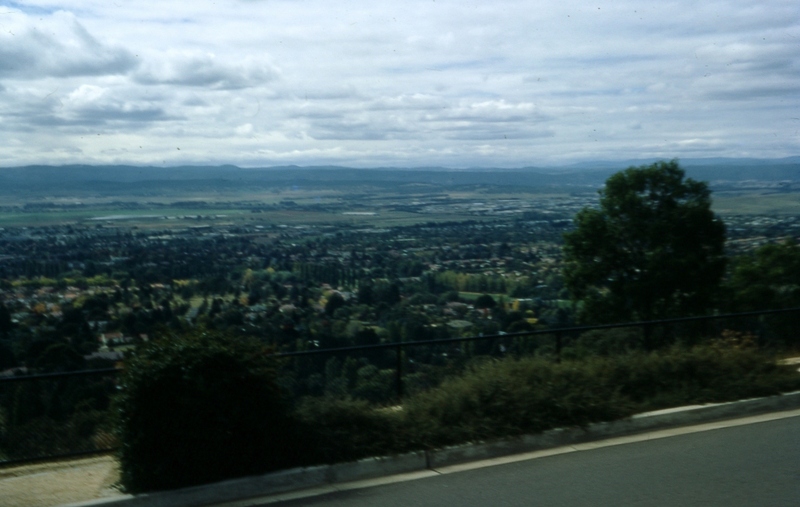 View of a portion of Tumut towards Mundongo, Lacmalac & Tumut Plains and further. Taken from Rotary Lookout. A long stretch of dusty road, up one hill and down another, through overlasting gum tree and stringybark, now and again passing Little "cockatoo" homesteads with occasional glimpses of a river away to tho right. The horse lumbers on at a steady jog, the horses knowing to a foot how far it is up each hill, aud pulling doggedly till they got to the top, and then letting her run down the other side. The air is bright, rarifled, intoxicating, for we are a few thousand feet above tho sea, and there is a dry, sweet scent from the gum trees. Here and there, in the grounds of the farm houses, one notices that the plants are all cold-country species-gooseberries and cherries making a considerable show. But there is nothing also about the road from Gundagai to Tumut that is much different from any other Australian road, until suddenly the coach tops a rise, and there, far away up a vast green flat there is a little white town nestled in under the shelter of a big range. Poplars, willows, maize fields, tobacco plantations, all make up a' green setting for this little white town, that contrasts oddly with the staring, glaring nakedness of the usual Australian township; and as the coach drives up to the town, through the hedges of raspberries and across a river, whose banks are smothered in green herbage, lt scorns as if one had left Australia altogether, and had arrived in some new country. HOW FOLK LIVE IN TUMUT. The climate of the town is variable. 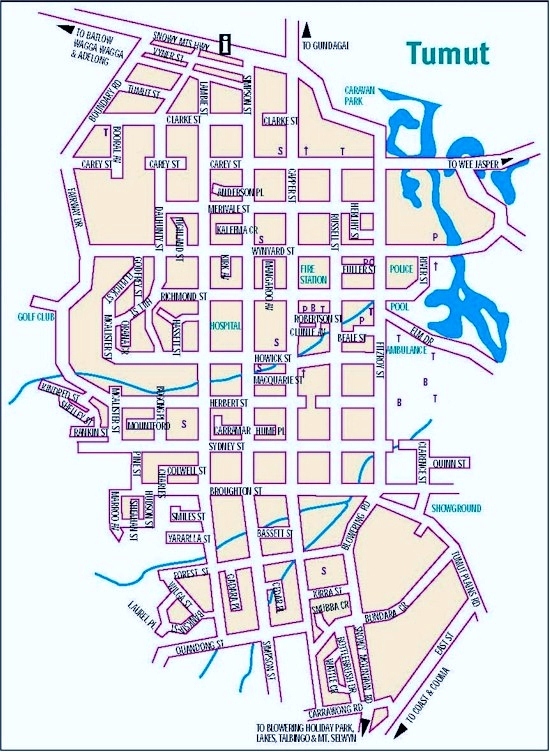 It can be hot enough in Tumut to suit the most thin blooded Queenslander, and it can be cold enough to nip a Nova Scotian; but, as a rule, the days are crisp and bright, with cool nights, and at tho worst a fairly coal night can always be got by Map Showing Situation of the Federal Capital Site. going a little way up the range. The main attractions of the town as a residence are the river and the hills. The valley of the Tumut River is one of the richest pieces of land in Australia. It is about two miles broad near the town, and every foot of it is good lucerne land. Tobacco does well shorn, too, but the mainstay of tho town is the fact that it is a distributing centre for a lot of little settlements hidden away in the mountains. There is a little mining done, and occasionally a few fossickers that have struck a patch will come in and wake the town up a bit; but the great standby of Tumut is the money brought in by the "cocky," the small settler who has his 100 acres away up in the mountains, in some parts is rough that pack-horses are not unite extinct yet in the district. All land in the district is very good or very bad, and most of the settlers have a little bit of good river or creek flat, and make it out with pasturage on thc mountains. Sturdy pioneers those mountaineers are, too. 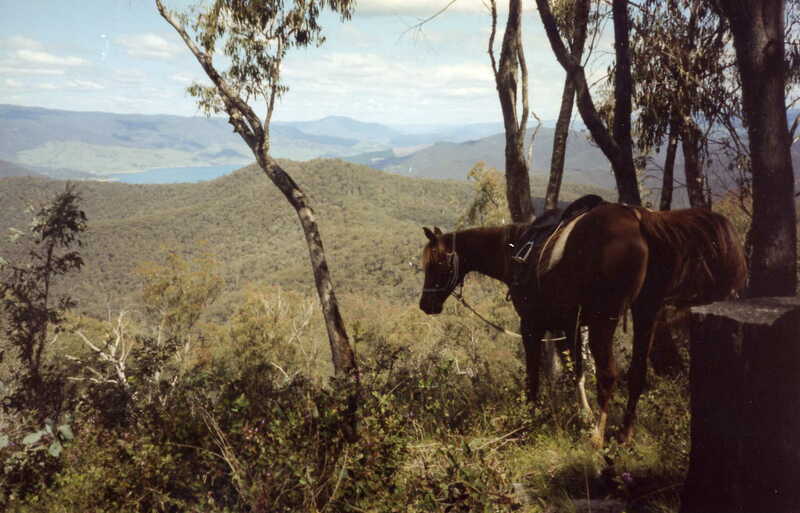 They drive into Tumut at the weekend in weird conveyances that have come down mountain sidings and across fathomless Bullies unharmed; while their horses, with the true swing and action of the mountain horse, pace up and down the streets. They are different from any other Australian settlers, the isolation, the cold climate, and the constant mountain climbing making them a wiry, hard featured lot, more are live and enterprising than the ordinary Australian. It ls said that for its size Tumut sent more men to tho war than any other part of the world. Those who know Australia from end to end say that, apart from the attractions of Sydney or Melbourne, they would as soon live in Tumut as in any part of the continent that could be selected. The river is a great standby for rowing, mid trout should do well in its upper waters. A few miles up the mountain are the Yarrangobilly Caves. All round the town are the mountains, at present rapidly being populated by millions of trout; and down the river, are thousands of acres of splendid land, for farms or gardens; so that the legislator who makes his home in Tumut can find sport, sight-seeing, and recreation ready lo lils band, and, judging from tho old men, and the look of the children, there is no more healthy place in Australia. There is only one real drawback, and that the distance from everywhere, The barrister, who has to attend consultations, and the merchant, who has to conduct his business, will find it an awful strain, dragging up and down the miles of railway to the little mountain, town, It is said that a d�rect line from Tumut to Wagga will yet be made, and this would slow the trip for Melbourne folk a great deal; but the line to Yass, which is the most direct way to Sydney, is almost impossible, the country being very mountainous. The principal drawback to life in Tumut will be the lack of theatres, amusements, the shopping, and the communication with the outside world, which goes to make life worth living to the busy man. VIEWS IN THE TUMUT DISTRICT. The Buddong Falls ck Team on the Road. The Tumut Rivern Bridge on the Road from Tumut to Gundagai. PETITION.- For some time past the residents on the upper part of the river, at Blowering, and Yarrangobilly, have had good reason to complain of the want of a bridge over the Tumut river, on the main road to Kiandra, The traffic had to make a detour of some seven miles over Tumut Plains, which, during the late dry seasons, did not signify much; but during the late wet winter, and even quite lately, the road over the plains has been almost impassable, involving both a serious loss of time and no end of inconvenience, A petition to Government is in course of signature, praying that a sum of �500 be placed upon the estimates for the purpose of erecting a bridge at the old punt. THE RECREATION GROUND.-The Police court case pending with reference to the right of ingress and egress to the recreation ground had to be postponed on Friday last to Friday next, owing to the sitting of the District Court. THE WEATHER, CROPS, &O.-During a few days of the past I week we had oppressively hot weather, and close sultry nights, which on Sundny last gave way to a better state of things. Yesterday we bad a bl listerine dust storm, which lasted all day. Towards evening the sky became overcast, with all appearances of speedy rainfall, but at nightfall a sud- den change took place, and this morning was one of the coldest of the season, an Icy wind blowing up to noon. Hay making is now proceeding rapidly all over the districts. Grain crops are looking very well, except in low-lying localities, where a good deal is lying flat. The lambing season has been very favourable. Stocks coming to the summer quarters in the mountains fast. At the end of last week two mobs of 6000 each passed through town from Wagga for Argalong and Snubba station, the property of Messrs. A. Gilman and S. M. Swift. Shearing ls now going on, and reports from the various sheds are very Houriahing. THE BUSHRANGERS. - Early this morning our Police received Information that armed men had been seen in the mountain recesses of Yarrangobilly, on the road to Kiandra, and in the course of the day Sergeant Hoellner received orders to go in pursuit in conjunction with reinforcements from Gundagai and Adelong. The latter came in late in the afternoon, and a start was made by the indefatigable sergeant in the evening. They are supposed to be the two strangers belonging to the Kelly gang. Sergeant Joelmer has already, in the old days, won his spurs against the bushrangers at Bombala, having been instrumental in capturing two desperadoes in that district in the days of Gilbert and Ben Hall. He is right through the man of the right sort, and it tells badly for the discrimination of his superiors that, after 23 years honourable service, he remains simple sergeant. As he is well acquainted with the mountainous defiles of the Snowy River there is every hope that messieurs the bush rangers will borun bard for their lives. - (Ref- Australian Town and Country Journal (NSW : 1870 - 1907)(about) Previous issue Saturday 30 November 1878). CANCELLED RESERVATION OF LAND. � Referring to Gazette notice, dated 7th November, 1871, reserves from conditional purchase on account of population of towns : It is notified for general information, the village of Cathcart not containing by the final census of 1871, as laid before Parliament, 100 inhabitants, the said reservation of land on account of population of Cathcart has been withdrawn from said notice, and is hereby cancelled. A man named Malcolm Gillios was found dead in an out building at the Commercial Hotel yesterday morning by the landlord. Deceased is as a dealer and drover, and resided in Junee. At the inquest a verdict was returned that death was due to natural Causes. - (Ref- The Sydney Morning Herald (NSW : 1842 - 1954)(about) Previous issue Monday 15 May 1899). Mrs. Signboard's Maid: Please, sir, in a novelette I have been reading it says "the table groaned beneath the good things." What does it mean? The Hoarder: Oh, in ancient boarding-houses the tables may have groaned, but nowadays the boarders do it. Ten girls in a composition class were told to write a telegram such as would be suitable to send home in case of a railway accident while travelling. One of the girls wrote:-"Dear papa. Mamma is killed, I am in the refreshment room." Phyllis: Yes, he was paying attentions to her quite a long time. Blanche: Perhaps he hadn't the courage to propose. Phyllis: Oh, I don't know. Perhaps he had the courage not to propose. - (Ref- Western Mail (Perth, WA : 1885 - 1954)(about) Previous issue Saturday 1 August 1903). 1870 Appointment of ENUMERATORS for the CENSUS. Gentlemen appointed to be Enumerators under the provisions of the NSW Census Act for 1871. Full list given. 1880 - Tumut Certified Denominational Roman Catholic School - Mr Thomas CORCORAN, Teacher. 1897 - ACCIDENT - A lad named Dunn was playing with a loaded toy pistol in company with some others, in Tumut on Saturday, and when fired it burst, and the shot entering the boy's hand and lips. - (Ref- Australian Town and Country Journal (NSW : 1870 - 1907)(about) Previous issue Saturday 5 June 1897). Tumut. - A THRIVING AND PICTURESQUE TOWN. - RICH AGRICULTURAL LANDS. - (See illustrations on this page and page 27.) There are few if any agricultural districts in New South Wales possessing greater capabilities than in the rich belt of country around the thriving township of Tumut, which needs only the advantages of railway communication to come into greater prominence as an agricultural centre. At present the nearest railway station is Gundagai, twenty miles distant, although it was intended at one time to extend it to Adelong. However, the residents of Tumut do not quite despair of beholding the approach of the iron horse. The township is prettily situated on the southern bank of the Tumut River, which has for one of its tributaries the Yarrangobilly, from the limestone cliffs, where the famous caves are situated. Several of the roads loading from the town Mr. John Weedon, Mayor of Tumut ship are bordered with leafy hedbes, whilst there and there are stately poplar trees, which impant somewhat English aspect to the place during certain seasons of the year, and afford a good subject for the artist's pencil. An excellent view of the town and surrounding country is obtained from the summit of an eminence somewhat impoetically designated, Telegraph Hill. From here the leading building of the town stand out in bold relief. All Saints; Church with its fine graceful spire is deserved prominent. This large edifice was erected some sixteen years ago, the spire being constructed a the cost of Mr. C. D. Bardwell, of Oberon Station near Adelong. The church also possesses a beautiful stained glass window representing the Cruciflxion, the gift of Mrs. Shelley, in memory of the late Mr. George Shelley, of Tumut Plains. The interior of the church has a neat appearance The incumbent being the Rev. Richard Lee. The Roman Catholic Church is a fine massive stone structure, and stands upon an excellent site. Near to it is a convent and school, the latter being well attended. There are also Presbyterian and Wesleyan Churches, together with a Salvation Army barracks. The public school is a good substantial building, and has an enrolment of 230 children. The playground is a large one and has a very blue elm tree in the centre. The land upon which the school buildings and play ground are situated embraces an area of two acres, and Mr. James Ferguson, the master, is to be complimented on the excellant manner in which everything connected with the school is conducted. The postal and telegraph office is a commodious structure, centrally situated in the main street, as is also the courthouse. A new lockup and lock-up keeper's residence adjoining are of neat and ornamental design. The mechanics' institute has a good library, and is well patronised. There are also lodges of the Freemasons, Sons of Temperance, Oddfellows, and Orange Societies. The Bank of New South Wales and Commercial Bank of Sydney early occupies a very prominent position in the main thoroughfare, and the buildings are of handsome design. The Australian Joint Stock Bank is also represented by a branch. There are several good hotels in the town, among which Mrs. Fraser's Royal Hotel occupies a very prominent place by reason of its well merited reputation for good accommodation and excellent management. Mr. Madigan's Oriental Hotel is a large building, erected on the site of the old Queen's Arms, the first hotel erected in Tumut, and dating from the year 1850. The hotel, which was erected by Mr. Madigan, easily accommodate a large number of guests, and is well fitted through out in every respect. The extensive and well arranged stables at the rear of the premises contain stalls and loose boxes for about thirty horses: The buildings and yards together occupy about one and a half acres of ground. The Commercial is also a leading hotel, and commands a considerable amount of custom, being commodious and well arranged. There are several large stores in the town, foremost amongst which may be mentioned those of Messrs. R. A. Newman and Sons, and Messrs. Mandelson and Company. The former establishment is of an extensive character, and contains a large and varied assortment of general merchandise, all the newest and most striking novelties being always stocked. Mr. Newman is an energetic and valued townsman, and is foremost in all matters that tend to the advancement of the district. The stores of Messrs. Mandelson and Company are complete with ample supplies of drapery, clothing, mercery, grocery, hardware, earthenware, and crockery and general produce, and a very large business is transacted. The firm, which originally commenced business in Gundagai, came to Tumut in 1857, where they have since maintained a leading position. They possess large bulk stores, and indent largely from the home markets. Mr. John Weedon of the firm is the present Mayor of Tumut, and is deservedly popular with the towns people. Mr. H. Walker also has a large store containing drapery, clothing, boots and shoes, grocery, crockery, &c. A very large trade is also done in a special department for baking and confectionery. Mr. Walker has heen in business here since 1887, the present buildings being specially erected for him. The name of Ah Chee is known far and wide throughout the district, and his stores in which almost every marketable commodity is to be found commands an extensive trade. The Tumut Brewery is a flourishing industry, and has a reputation of brewing an excellent beer. 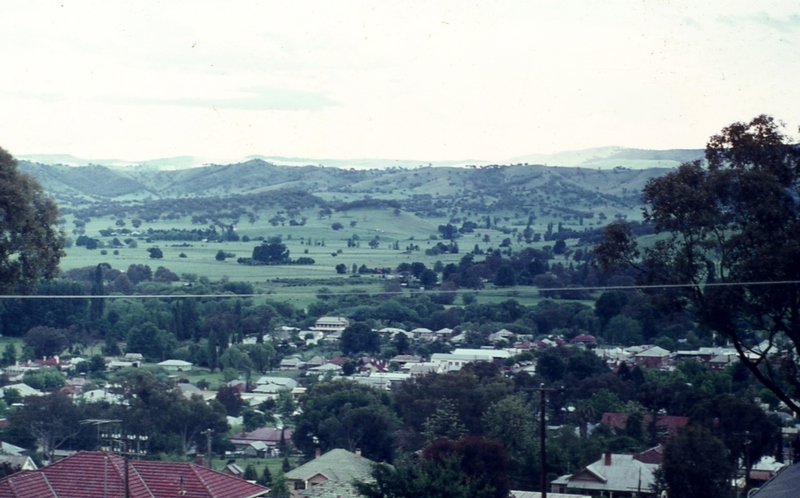 Most of the townships in New South Wales possess a recreation reserve, but here at Tumut it is over 100 acres in extent, and is prettily situated on the river flats, and is much used for racing, cricket, football and other sports. There is a grandstand, jockey stand, with commlttee, ladles, luncheon, and other rooms, bars, horse sheds, carriage paddocks, &c.
In another portion of the reserve is a cricket pavilion. The annual races are held in March, a spring meeting taking place in addition, besides semi-annual pony and galloway races. The racing track is one mile five chains in length. The president is elected annually, the present holder of the office being Mr. Robert Dear. Mr. C. S. Berne is the energetic secretary. The Agricultural Society's show ground covers an area of 0% acres, and is picturesquely placed near the recreation reserve, and, being planted with pines, willows, elms, and ether trees, presents a pleasing appearance. The ground is provided with a pavilion, cattle yards, pens for sheep, pigs, dogs, and poultry, and other necessary appurtenances. The annual show is held in February. Mr. R. A. Newman is president of the Agricultural Society, and Mr. Bland Clayton the esteemed secretary. Around Tumut the scenery is exceedingly beautiful. The town is bounded by ranges of hills stretching away on either side, and, as the middle distance and foreground are broken by tile winding river, the picturesque banks of which are shaded by graceful willow trees, the scene is most attractive. The rich agricultural character of the district was discovered during the earlier days of settlement, and the luxuriance of the maize and tobacco crops grown on the river has become proverbial. The Tumut maize differs from that grown on the coast, in that it keeps sound, and free from weavil when stored. Good maize and tobacco lands always command high rentals, and when land of special richness has been sold the price obtained is considerable, the available area being limited. One farmer, Mr. Wilkinson, owns 240 acres on the Tumut River. He paid �16 5s per acre for the land nine years ago, and since purchasing it he has leased it for seven years at an annual rental of 30s per acre. About 120 acres are planted with maize, and yields good average crops. Potatoes and hay are also grown. As much as 16 tons of potatoes have been obtained from a couple of acres, the soil being a rich black alluvial. Mr. E. G. Bridle is a representative farmer of the district, and possesses fine properties. Rosevale, which consists of 250 acres, is well cultivated; wheat, maize, and oats are grown extensively. On the Avenix Estate, at Brungle, he has a further interest in 150 acres of cultivation and 1600 acres of grazing land, where sheep, cattle, �nd horses are run. Last season his wheat crop averaged fifteen bushels, and the maize fifty bushels per acre. Dr. Mason has also a fine farm at Bombowlee. It has an area of 150 acres, and of this seven acres are orchard, planted principally with apples and cherry trees. Maize and tobacco have hitherto been largely cultivated. Some seven years ago a large area was leased to the Chinese for tobacco growing, on the halves system. Last year four acres of tobacco yielded 43cwt, or about llcwt per acre. Mr. French is the manager in charge. Mr. F. D. O'Sullivan is the largest farmer on Gilmore Creek, and has a holding of 1250 acres. From ninety acres of wheat sown last year he received 1800 bushels, an average of twenty bushels to the acre, and from seventy acres planted in maize he had an average yield of forty bushels per acre. He grazes a large number of cattle and horses also on the farm. The largest area under wheat amongst the farmers in the district is from 100 to 120 acres, the average being about eighty. The Gilmore Creek land is, as a rule, better adapted for wheat crops, but what land there is suitable for maize, is exceedingly fertile. One of the Gilmore Creek farmers secured the top average yield of maize, obtaining 120 bushels to the acre, a few seasons ago, and secured the Government prize. As a rule, the Tumut farmers grow maize and wheat and raise a few cattle, the holdings varying from 200 to 700 acres. - (Ref- Australian Town and Country Journal (NSW : 1870 - 1907)(about) Previous issue Saturday 12 December 1896). The event of the week has been the visit of Mr. John Doasy, M.P., one of the Irish envoys. Mr. Doasy arrived here last Thursday. He was met on the road, and escorted into town, by a large number of persons in buggies and on horseback. Upon his reaching Madigan's Oriental Hotel he received a congratulatory address, whioh was read to him by Mr. M'Namara, secretary of the reception committee. Mr. Doasy, who spoke from the balcony of the hotel, was warmly received by a crowd of persons gathered in the street. At night a public meeting was held in the Oddfellows Hall. It was attended by nearly 300 persons, who listened with marked attention and manifost signs of approval to an exhaustive specialy from Mr. Doasy on the subject of Home Rule for Ireland. Mr. William Bourke, of Blowering, ocoupied the chair. Messrs. L. Brennan, M. Arragan, C. S. Byrne, and J. Donaldson also addressed the meeting. A hearty vote of thanks was accorded to the lecturer; and subscriptions amounting to �6110 were handed intoward the fund in aid of evicted Irish tenants. A SPECIAL GRANT.-A telegram which reached Tumut, this week, from Mr. Travers Jones, the member for the district, caused immense satisfaction here. It said that a special vote of �612,000 pounds had been passed for the Tumut to Kiandra road, and that tenders would be invited as soon as practicable for constructing the new route over Talbingo. When this is done, and the portion of the road between the town and the Punt Bridge is put in order, a very great boon will be conferred upon our inhabitants. APPOINTMENT. - Our newly appointod C.P.S. arrived in town by coach on Thursday last, and began his official duties. His predecessor in office will leave Tumut for Inverell on Monday next. DEMISE.-An old resident of the district passed away last week, in the person of Mrs. Peter Beattie, of Blowering, who died on Sunday last, at the age of 55 years. She was a native of the district, and a daughter of the late Mrs. Thomas M'Alister, the first white woman who come to Tumut. COMING PLEASURES.-Groat preparations aro being made for the Mayor's ball, to come off on the 18th instant. It is expected to be a grand affair. This event is to be quickly followed by a flower show, a church picnic and concert, and the spring races.- (Ref- Australian Town and Country Journal (NSW : 1870 - 1907)(about) Previous issue Saturday 19 October 1889). TUMUT - TUMUT Golf- Club held their annual ball last Thursday evening. About 100 couples attended. Music was supplied by the Cootamundra Orchestra. The annual meeting of Tumut Tourist and Progress League was held last week, Dr. Clouston presiding. The report stated that during the year camping ground had been secured and fenced at a cost of �17/2/6. Folders numbering 1O,OOO had been published at a cost of �30 odd and distributed over the Commonwealth Representation were made to shire Council for the construction of tennis courts, which was granted, the tourist league guaranteeing �14 per year rent being 7 per cent, on the outlay; the shire council has also agreed to the request to form a bowling green; sign posts have been erected at various sections as a result of a request to the council. 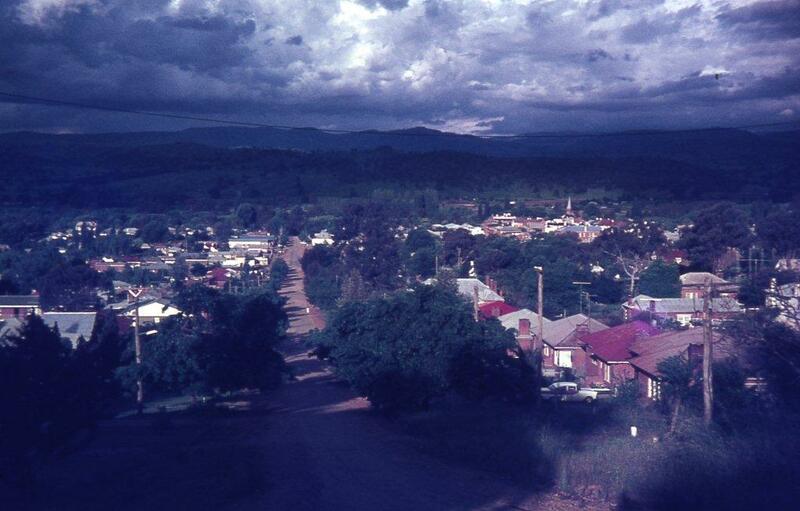 An additional copy of the picture film of Tumut was obtained and circulated through the State, and many minor matters attended to. The year commenced with a credit of �11.18.9 and ended with a surplus of �li3/12/3; receipts were �72/19/6, and expenditure �71/6/3. The follow ing officers were elected:� President, Dr. Clouston; vice-presidents, Mr. J. Wallace, Cfs. L. Cusack and J. Elphick hon. treasuer, Mr. S. Fleming; hon. seretarv. Mr. H. M. Potts: hon. PubLicity officer, Mr. H. Weeden; committee, Eev. F. W. Eettie, Cr. H. Godfrey, Messrs. E. M. Thompson, W. H. Crampton, H. H. Crouch, J. Perry, G. Gorrell L. D. Maitland. C. W. Williams. E. M. O'Regan, and M. E. Archer. A vote of thanks was accorded the hon. secretary (Mr. H. M. Potts) for his work during the past year and to the shire council for courtesy extended. Tumut people have raised �90 to assist the Woodbridge family, who are in very poor circumstances, Mr. Woodbridge having been an inmate of the local hospital for some time past. The managers of the fund are applying to the Government for a small piece of land on which to erect a cottage for the family, an an offer to build a small homestead for �60 has been received, as well as another generous offer to partly furnish the cottage. The Star Hotel has changed hands: The late proprietor of the Railway Hotel, Junee (Mr. C. P. Byrne), his wife and family are taking over. Miss Dulcie Davis, daughter of Mr. and Mrs. Fred Davis, of Capper Street had a minor operation performed prior to an operation for removal of the appendix, Drs. Browne and Clouston being the surgeons. The committee of the 1st Tumut Boy Scouts Troop met at the intermediate high school. Mr. Berry occupied the chair. It was decided that the secretary (Miss M. Watson) write to the Eastern Riverina Boy Scouts Association to inquire as to what the necessary qualifications of a Cubmaster must be, the idea being to form a Wolf Cub Pack in Tumut. A social and euchre party are to be held shortly in order to finance the committee. The assistant scoutmaster's report was received and adopted. It was stated that as 1st Tumut Boy Scout Troop ia now an open troop any boy in the Tumut district who is 12 years of ago or over is eligible to be nominated to the troop. Gundagai footballers visited Tumut, the latter team winning by 34 points to 9. During June Tumut Hospital jrccoiv ed �1053/l'9/3i O� this amount �705 was subsidy, �133 was the re sult of the hospital ball, �61/3/7 from the Friendly Societies' Association and �30.3 from air effort by Mrs. Eoe, of Adelong. The hospital has been treating an average of 14 patients a month recently. - (Ref- Albury Banner and Wodonga Express (NSW : 1896 - 1939)(about) Previous issue Friday 25 July 1930). TUMUT - THE Silver Jubilee social realised �24, plus the sale of Jubilee medals. A flag dauce was won by Mr. B. Robinson and Mrs. Casey. Mr. R. C. Bowler's homestead and contents were destroyed by fire. The home was situated at Argalong. It is surmised that during the temporary absence from the kitchen, a piece of wood fell from the stove. and the room was soon in flames. Mr. and Mrs.Bowler, and their niece, Miss Orlander, managed to save a few articles out of the front rooms, before the fire obtained too great a footing. All valuables and personal treasures were destroyed. Since the retirement of Scoutmaster John French, Scoutmaster .E. J. Farnville has taken over the Tumut Scouts. A portion of the Top Park has been made available for the erection of a Scout hall. A cup is being offered for efficiency amongst second class scouts. The �1 donated by Mr. S. Crampton for the first Tumut player to score a try in the Maher Cup, was won by Jack Cruise. A District Committee formed in connection with the King's Jubilee Shilling Fund decided to ask the Town Band to organise a Sunday night concert, and to ask Mr. Stathis if he would arrange for the screening of 'Royal Cavalcade' in connection with the appeal. The associates 18-hole stroke com petition resulted: � Mrs. Holloway, 99 �22, 77; Mrs. M. Archer, 104�28, 76; Mrs. H. Smart, 105�23, 82; Mrs. T. Eurell, 112�30, 82. Mrs. T. Eurell was the winner of Mrs. Archer's tronhy. Tennis Tournament: � Ladies' Doubles, Semi-finals: Mesdames Anderson and Eilcy d. Mesdames O'Leary and Troweek, 8/6; Miss Crouen and Mrs. Muir d. Mrs. Taylor and Miss Murphy, 8/3. Final: Miss Crouch and Mrs. Muir d. Mesdames Anderson and Eiley, 8/5. Men's Doubles, ?Semi- finals: AV. Green and F. Sylvester d. Purccll and Welch, 8/3; -Stacy and Stacy d. E. Sylvester and Whyte, 8/7. Final: Stacy and' Stacy d. F. Sylvester and Green, '8/4. Mixed Doubles, E. Sylvester and Mrs. Taylor d. T. Mr,,and Mrs. McBride, 8/4. Singles, Semi-finals: Mrs. O'Leary d: Mrs. Anderson 7/15;- Miss Jeffrey d. Mrs. Iveraeh, 6/3. Final: Miss Jeffrey d: Mrs. O'Leary, . 7/5. Men's Singles, Semi-finals: E. Sylvester d. G. Stacy, 6/2; - W.- Whyte d. L. Sacy, 6/3. Final: E. Sylvester d. AV. Whyte, 6/4. - - Tumut- Tennis Club held a social and euchre tournament. The Monte Carlo dance was won by Mrs- Taylor and Jepsen. Mrs. M' Mullen and Mr. Graham M'Donneli won at euchre. 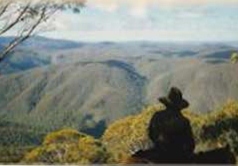 The Tourist and Progress League decided, to ask the Gundagai Pastures Protection Board to invest the control of the reserve, between the Factory and the pumping station, in the shire council, so that people could be prevented from taking the soil, the result of which was that trees planted by the shire there were falling over through lack of support. The C.W.A. treasurer reported that the financial position showed a credit of �104/13/4, It was decided that a motion be put on the agenda paper that Younger Set members be allowed to be members of the parent branch and Younger Set at tho same time. The annual birthday of the branch was discussed and it was arranged that an afternoon be held on June 20. The articles made from Maehramc tvino were judged, and the prize (donated by Mrs. J. Broughton) was won by Miss Griffin. At a tennis social Mrs. F. Fitzgerald, who is leaving the district, was presented with a sandwich set from members of the club. Mr. Leo T. Day, son of the late Mr and Mrs. James Day, of Tumut, died at a private hospital in Paddington, from war disabilities. He was 49 years of age. Junee Rugby League footballers visited Tumut to play for the Maher Cup. Tumut proved the victors, with 22 points to 3. Brungle Junior Farmers' gardening competition was won by John Burns. A show ball is to be held in July. At the Police Court, Sergeant Stewart asked the P.M. to adjourn the court for a few minutes to allow a presentation to be made to Constable F. J. Fitzgerald, who was being transferred to Sydney. The P.M. (Mr. J. A. Balmain) made the presentation, a travelling rug, and spoke of tho constable's good qualities. A number of the constable's friends met to bid him farewell. He was presented with an easy chair as a mark of esteem by his friends. Miss E. Carr won the 18-hole eclectic handicap for Mrs. H. D. Smart's trophy, with 32 net. The new club house at the golf links was opened by the president (Dr. Harbison). Mr. F. Belle, professional of the Cootamundra Golf Club, gave an exhibition of trick shots. A mixed foursomes was played, resulting: � E. J. Holloway and Mrs. Holloway, 57 � 1.5, 42; H. J. Byrne and Miss N. Lynch, 59 � 15, 44; D. Livingstone and Mrs. Livingstone, 9 � 15, 44; K. Kneebone and Miss Masters, 61 � 17, 44. A euchee tournament was held at the residence of Mr and Mrs C. A Oddy, Bowler's Flat, in aid of the Spring Flat P and C Association. Three ran equal for the men's prize � Messrs. C. A. Oddy j J. Forsyth and W Cooma. . They handed back the prize. Mrs. C A. Oddy was the winner of the ladies' prize. - (Ref- Albury Banner and Wodonga Express (NSW : 1896 - 1939)(about) Previous issue Friday 14 June 1935). A SOCIAL, was tendered to lady members of Gilmore Agricultural Bureau, and a presentation made to Miss F. Campbell. Visitors were present from Batlow and Tumut Plains branches. A presentation of a lady's toilet set was made to Miss F. Campbell, who is leaving the district, by Cr. T. O'Brien on behalf of fellow members, as a mark of esteem. A social held in the Spring Flat hall returned �4 profit, to be devoted to the hall fund. The Monte Carlo dances were won by Miss Percival and partner, and Mrs. D. Jones and partner. The P. and C. Association subsidised school at Spring Flat held a euchre tournament at the residence of Mr. and Mrs. C. A. Oddy, Bowler's Flat, in aid of their annual picnic. The winners were Miss J. Cookson, Miss R. Morris, Messrs. C. Davey and R. Harris. A dance held at Lacmalac, organised by members of the hall committee, returned �9. The Tumut Church of England Fellowship Dramatic Club staged 'What Happened to Jones. There was a fair attendance, and the audience thoroughly enjoyed the performance. The golf trophy winners during the season were: � A grade championship, F. Miller; B grade championship, W. Clout; president's trophy, D. Livingstone; captain's trophy, W. Scotton; secretary's trophy, H. J. Byrne; Mr. H. Weeden's trophy, B. Robinson; Mr. H. Smart's trophy, E. Baker; King George IV trophy, J. Baker; Mr. F. L. Baker's' trophy, Dr. J. Mason; Forsyth cup, J. Peach. All clubs were represented at a meeting of Tumut District Cricket Association. It was decided to run a competition in two divisions, four teams, Billiards-room A, Batlow A, Tumut Plains and Gilmore to form the A division, and Billiards-room B, Batlow B, Lacmalac, Wyangle-Gocup and the Ten-stoners (Tumut) the B division. The A division play for the Stabback cup, and the B division for the Baker cup. The C.W.A. has sent letters of condolence to Miss Bourke, Mrs. Barrows and Mrs. Allan Downing; also to Mrs. Broughton, secretary of Tumut branch, who has been ill in Sydney. At a Tourist and Progress League meeting the secretary for railways wrote, stating that the request for the erection, of a covered-in-way at Tumut railway station for unloading facilities could not be acceded to. It was decided to make representations to the Government Tourist Bureau so that Tumut would be recognised as a tourist centre. Mr. Staunton gave notice of motion that he would move at next meeting 'that a publicity officer be appointed'. At the annual Masonic installation of Lodge Tumut Unity the following were invested: � Wor. master, Wor. .Bro. Wilkinson; IP.IvL, Wor. Bro. W. F. AcGiuor; S.W,., Bro. II. V. Smith; J.W., Bro. R. Dunstan; chaplain, Wor. Bro! J. Malcomson; treasurer, Wor. Bro. J. Edgar; secretary, Bro. D. J. Sanipson S.D., Bro. G. Smith; J.D., Bro! H. H. Robinson; : director of ceremonies, Wor. Bro. T. Quarmby; I.G., Bro. W.D. Percival; tyler, Bro. C. Allatt. A banquet was held in O'Brien's Hall. 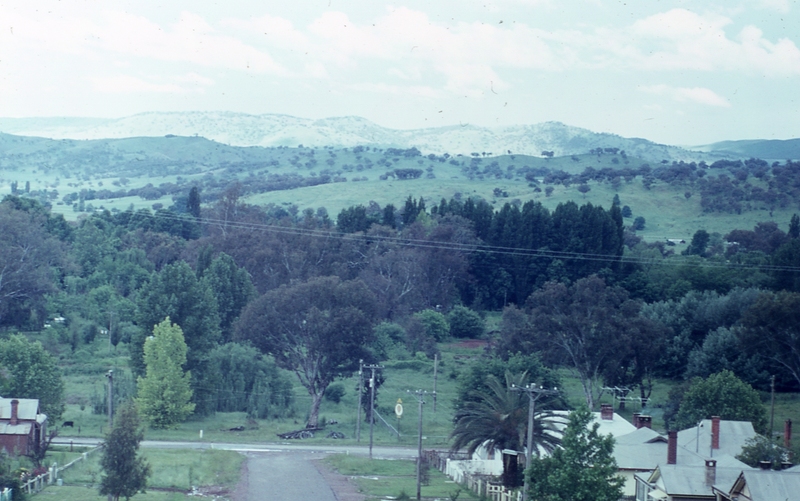 Jock Claffey (Tumut Plains) 4. - (Ref- Albury Banner and Wodonga Express (NSW : 1896 - 1939)(about) Previous issue Friday 18 October 1935 Page 36). .1890 - ACCIDENT - [BY TELEGRAPH.] (FROM OUR CORRESPONDENT.) TUMUT, TUESDAY. - A serious accident happened to the Adelong mail coach this evening. When coming down hill near the Killarney and Gilmore roads the near front wheel came off, and the coach capsized. Glynn, the driver, was severely injured about the face, and a passenger named Dixon dislocated his ankle. Both were taken into Tumut in a cart. Thomas Nestor, landlord of the Woolpack Hotel, received a compound fracture of the leg and other injuries. Mrs. Tutt and her infant escaped uninjured. - (Ref- The Sydney Morning Herald (NSW : 1842 - 1954)(about) Previous issue Wednesday 1 January 1890). CROWN LANDS BEYOND THE SETTLED DISTRICTS. CAVEATS AGAINST CLAIMS TO LEASES. CROWN Lands Office, Sydney, March 5, 1849. With reference to the several notices in the Government Gazette, publishing claims to leases of runs beyond the settled districts, it is hereby notified, for the information of all parties interested, that caveats have been received against the claims specified in the accompanying list. 2. It is to be understood that no new caveats, having reference to demands already advertised, will be received after the present date, except for special cause show. 3.Parties interested will be allowed personal access, if they so desire it, to the caveats already lodged, on application at this office. 4. Any caveat may be withdrawn by the party lodging it on a written application being made to that effect, the signature to such application being attested by a Justice of the Peace, or a Commissioner of the Supreme Court. 5. If within two months from the present date the caveat in any case shall not be withdrawn, as above, the demand to which it relates will be referred for the investigation of a Commissioner, appointed under the Act of Council, 11 Vic., No. 61, and the parties subjected to the expense of that proceeding. 16S. Tom pson Charlesl'.u.ionynrunyn, L. F. De Salis ; loo. Thorn, James, Montabiidgery, J. and W. M'Arthur . 16. Boyd B,(now W. S. Bovd), lHniliqnin.'QcorgcShaw*. 99. Lewis Charles, AVcciaspcr, Eleanor Terry ;. 130. Osborne Henry, Bevokong Mana Arujop, or Old Man Creek, James Rudd. 147 Robertson and Davidson, Bullaibung, John Bray; 151. 156. Stuckey, Henry, Tumblong, P. Stuckey, sen.
189. Wall James Egan, Hanging Hock, Robertson and Davidson. MANEROO. - No. of claim as gazetted - 6. 139. Williams John, Head of Curry's Flat, D. M'Donald.